Howard is a founding member of the firm, and is a trial attorney who has been trying cases for over 30 years throughout New York and New Jersey. He has successfully prosecuted cases involving catastrophic injuries and damages, achieving millions of dollars in verdicts and settlements in cases involving medical and hospital malpractice; automobile accidents; premises liability; labor and construction site liability; municipal, transit and Port Authority liability; the manufacturing and distribution of dangerous and/or defective products, including all-terrain vehicles, medically implanted devices, as well as factory machinery; discrimination; sexual harassment; and defamation. In addition, Mr. Suckle has successfully litigated significant property damage cases resulting from chemical and petroleum spills, as well as a wide variety of multimillion dollar commercial cases. A graduate of the University of Buffalo School of Law, Mr. Suckle was admitted to the State Bars of New York and New Jersey in 1987. He has also been admitted to the Federal Bars in the Eastern and Southern Districts of New York and the District Court of New Jersey. Additionally, Mr. Suckle has been admitted Pro Hac Vice to handle head trauma and brain damage cases in the States of Florida and California. 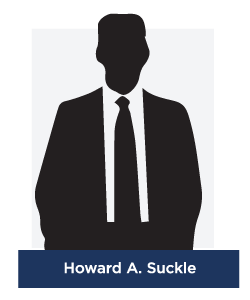 Mr. Suckle is a member of the New York State Trial Lawyers Association, and has represented the families of 911 victims for claims to the September 11th Victims Compensation Fund. Glenn is a founding member of the firm, and has been a practicing attorney for over 30 years throughout New York and New Jersey. Mr. Schlesinger has extensive experience in the handling of complex commercial and residential real estate transactions; business formation; contracts; and consulting; as well as contractual and other related litigation matters. Mr. Schlesinger also has a great deal of experience representing victims of serious personal injury matters. Mr. Schlesinger’s accounting, auditing, tax and CPA background allows him to offer a unique perspective to his clients on their real estate and business transactions and all litigation matters. After earning his Juris Doctorate from Hofstra University School of Law in just two years, Mr. Schlesinger was admitted to the State Bars of New York and New Jersey in 1985. He has also been admitted to the Federal Bars in the Eastern and Southern Districts of New York and the District Court of New Jersey. Prior to forming the firm, Mr. Schlesinger was a successful solo practitioner for over 12 years. Corinne joined Suckle Schlesinger PLLC in August of 2008, after being a legal intern with the firm from December 2007. 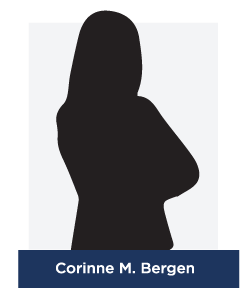 Ms. Bergen has extensive experience representing clients in cases involving medical and hospital malpractice; automobile negligence; real estate matters; labor and construction site liability; municipal liability; property damage cases resulting from chemical and petroleum spills; contractual litigation; employment contracts; as well as discrimination; sexual harassment; and defamation matters. She is involved in every aspect of litigation, from the commencement of an action to post-trial litigation and appellate practice. Ms. Bergen earned her Juris Doctorate from Hofstra University School of Law in May 2007. While in law school her work was published in the Journal of International Business and Law and she served as Article and Solicitations Editor of that publication from 2006-2007. Prior to attending Hofstra Law School, Ms. Bergen received her Bachelor of Science, graduating with Honors from Fairfield University in 2004, where she majored in Politics, minored in Peace and Justice and was a member of the Dean’s List and the National Political Science Honor Society.